Smooth finish, classic Silver Rustic color and elegant design, use the Real Flame-effect Candles in locations where you would use real candles. ON-OFF: Turn the candles ON/OFF (Note: Before you use the Remote Control, switch the ON-OFF button to ON at the bottom of the LED candles). MODE: Candle- Moving Flame; Light- Non-Moving Flame. BRIGHTNESS: Left button to lower the brightness Right button to increase brightness. Add our Eldnacele Flameless Candles with Remote & Timer 9-Pack to your cart today. 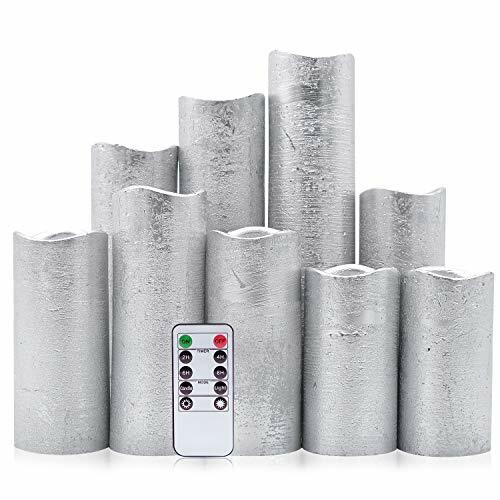 ✪PACKAGE INCLUDING: This set includes two 4" pillars, two 5" pillars, two 6" pillars, a 7" pillar, a 8" pillar and a 9" pillar (each 2.2" diameter) Silver candles, a user manual, a 10-key remote control with 2H/4H/6H/8H timer. These decorative led candles are 2 AA battery operated(not included). ✪REAL WAX & FLICKERING FLAME: The candle shell is made real paraffin wax, while there is no burning wick, annoying smoke or messy drippings. Flickering flame makes these candles no difference with traditional candles, which can be placed where you would use real candles. ✪REMOTE CONTROL & TIMER: With the included 10-key remote control, you can control all the candles at a time or individually. Timer feature allows you leave the candles along with no need to turn them off manually, cycle every 24 hours. ✪SAFETY IS PRIORITY: Environment friendly flameless flickering candle set creates peaceful and romantic atmosphere at your home, however, there is no fire hazards, smoke or safety concern even around with your little ones. Ambient warm white glow suits for relax your body and mind, it's safe even if you forget turn them off. ✪DECORATION & GIFT CHOICE: They can be widely applied to Birthday, Christmas, Home decorations, Bars, Hotel, Parties, Holidays, Wedding, or other occasions. Perfect gift choice suit for all ages from children to seniors. If you have any questions about this product by Eldnacele, contact us by completing and submitting the form below. If you are looking for a specif part number, please include it with your message.